The Space Squad is back! Earlier today, James Gunn shared the first promo images from the Guardians of the Galaxy VOL. 2 on his social media. 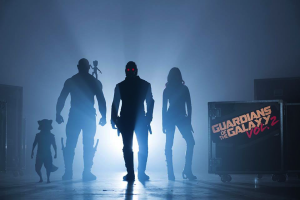 The image contains the glorious silhouette of the cast form the first season with baby Groot holding onto Drax’s ear. Marvel studio and director James Gunn announced that Guardians of the Galaxy VOL. 2 officially started shooting and will be joined by new cast members. New cast members include Kurt Russell, Elizabeth Debicki(The Man from U.N.C.L.E.) Chris Sullivan (The Drop) and Pom Klementieff (Oldboy) will join the misfit space heroes. The awesome Kurt Russell is rumored to play the mysterious father of Star-Lord but his exact role is still to be spectated. They have begun principal photography in Atlanta, Georgina and the production will shoot at Atlanta’s Pinewood Studios as their roles. The original Guardians of the Galaxy was a hit earning over 770 million at the worldwide box-office as well as a brilliant achievement of the sound track for the movie getting nominated for a Grammy. James Gunn mentions that there will be more surprised coming and we are extremely excited to know what they have under his sleeve. Release day for Guardian of the Galaxy VOL. 2 is May 5, 2017! Leave a comment below if you’re stoked like Groot!